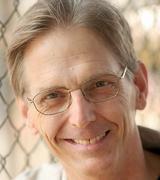 Gregg T. Daniel has a diversified and well-known career as stage director/actor and television/film actor. His stage direction includes 2009's critically-acclaimed production of Tom Stoppard's Heroes at the Group rep and Sybyl Walker's Beneath Rippling Waters presented by the Company of Angels @ the Fremont Center in Pasadena in 2006. More recently he helmed Group rep's critically acclaimed Cobb. In this chat, conducted by guest interviewer Steve Peterson, Daniel discusses his latest directorial work Elmina's Kitchen for Lower Depth Theatre Ensemble (LDTE), opening August 11 at the Lost Studio on La Brea in Hollywood. 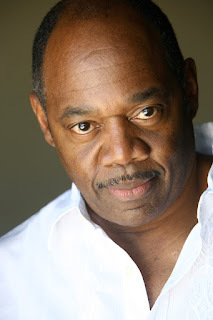 Most recently, I performed in a production of August Wilson’s Jitney at South Coast Repertory in Costa Mesa. The production transferred in its entirety to the Pasadena Playhouse for another month long run. Prior to that, I directed a critically acclaimed production of playwright Lee Blessing’s Cobb for the Group Repertory Theatre. I’ve also been a visiting Guest Director at USC’s School of Theatre. I’m returning to the school in early October to begin rehearsals with the undergraduate class on Flyin West by Pearl Cleage. How did Elmina's Kitchen come to your attention? Earlier this year, I was invited to take part in a presentation at USC titled “Voices from the Black Diaspora.” We presented selected staged scenes from three international playwrights. One of the plays was Elmina's Kitchen by British playwright, Kwame Kwei-Armah. I was exhilarated by the two scenes we read from his play. The next day, I ordered a copy of the play from Amazon. After reading it, I knew our company had found its next production. LDTE's first production, Three Sisters After Chekov, was well received. You directed the play, and the other founding members were in the play. With Elmina's Kitchen you are directing, but the other company members are not in the production. How did that weigh in LDTE's decision to choose this play? While I was convinced Elmina’s Kitchen was artistically right for our company, I recognized none of the six roles in the play suited the company’s founding members. This situation presented us with an interesting dilemma. Does LDTE only mount plays which has roles for its core members? It was a difficult choice to make but in the end, the decision was unanimous. Every one of our members felt we needed to mount this work. The compelling nature of the piece made it a story we wanted to tell. Elmina’s Kitchen deals with three generations of black men and their struggles to survive in a highly volatile area of London known as “murder mile.” I think the play is about choices. What conditions influence our choices and the ramifications of those choices. The decisions we make not only affect our immediate family, it affects our community as well as the society we live in. What are the challenges in directing this play? One big challenge in directing the play is to not make it feel foreign to our theatergoers even though the world it’s set in (inner city contemporary London) is culturally specific. There are amazing parrarels within the play to our own country’s troubles with gang violence, broken families and racism. What is the take away - - what do you want the audience be thinking about or feeling after the play as they leave the theatre? I welcome a situation where our audience feels a variety of things when leaving the theatre. I never want to dictate how the audience should feel since aspects of the story will affect each theatergoer in a different way. I only hope they find within the material some aspect of their humanity which would make the experience resonant for them. The playwright currently resides and works the United States. Any chance he might be in attendance at any point? Yes, our playwright, Kwame Kwei-Armah, has expressed an interest in attending the West Coast premiere of his work. 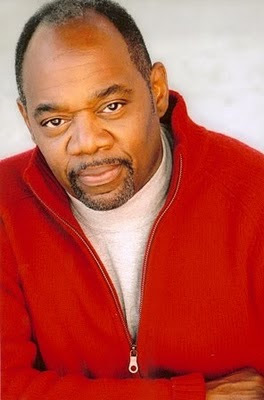 Kwame is currently the Artistic Director of a major regional theatre, Centerstage in Baltimore, Md. We’re trying to work out the details that would allow him to visit. For LDTE, is there something in the planning stages for your next production? LDTE is interested in fulfilling our commitment to developing new works, which is part of our mission statement. To that end, we’re planning a workshop in January 2013 where we will work with a playwright (s) in the early stages of his (their) work. Next up, I will be directing a staged reading of Alice Childress’s Wedding Band for the Antaeus Theatre Company’s annual Classicsfest. It’s a bittersweet story that examines the relationship between a white man and a black woman in 1914 when our country’s miscegenation laws were in effect. 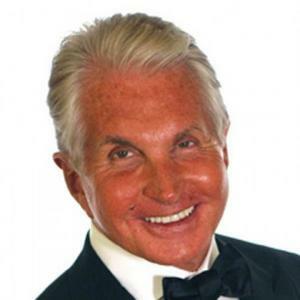 Legendary actor George Hamilton, a major film star since the late 50s, is currently treading the boards in the national tour of La Cage Aux Folles, opening July 11 at the Pantages Theatre. 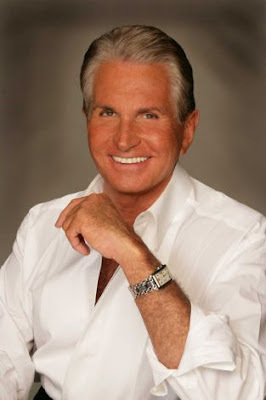 Known for such film hits as Love at First Bite, Zorro the Gay Blade, All the Fine Young Cannibals, Light in the Piazza, Where the Boys Are, Your Cheatin' Heart, and Crime and Punishment USA, Hamilton has been referred to as more "famous for his debonair style and his perfect and perpetual suntan". He admits to it himself and in our chat, with his self-deprecating sense of humor, jokes and tells very amusing anecdotes. 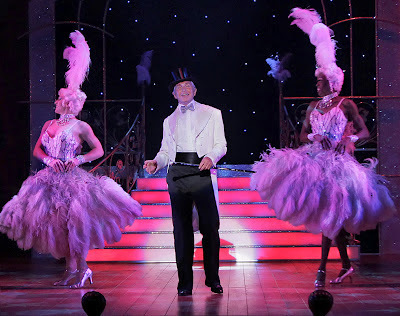 Let's talk about La Cage Aux Folles. How long have you been on tour? For nine months, I think. I've had stretch marks for nine months. Let me think about it. In October we started, and I started rehearsals in August. Are you having a good time playing Georges? Are you enjoying working with Chris Sieber? He's an incredible professional. I only have to look at Chris to say, "Well, you do the next line". He knows both parts and all the music; I some times feel like a ventriloquist. You also did Chicago, right? What other stage work have you done? Chicago was my first Broadway show. I've done maybe 26 plays...dinner theatre and summer stock. I used to make people think I was in the south of France while I was actually trying to learn to act. I went on the road. I did Funny Girl with Barbara Cook. We had such a great time together. (he laughs) I'll never forget...we were in Westbury, theatre-in-the-round. (He sings) "I want to be seen, be seen with you, with you on my arm..." All of a sudden I remember seeing a vertically challenged fellow, nowadays, we'd say a dwarf or little person...he was walking across the stage as we were singing this. I realized he must have had to go to the bathroom on the other side of the stage. Barbara's in the middle of "People", and he's coming back across the stage. I went over to him and said, "Forgive me, but since you missed it, I want to do that number for you again." So I repeated "I want to be seen, be seen..." Fun! It was as much fun as what happened recently in Orlando during Cage when all the lights went out. The lights went out, the air conditioning went off , and out there was... me, singing a duet...I'm singing away and all of a sudden I realize it's completely pitch black, there's no sound, and all I hear is my voice. I turned around, and everybody had left the stage. I looked at the audience and said, "I always wanted to do a one-man show." It was the moment of my life. I never enjoyed anything as much. I had such fun and the audience saw that I had fun, and I got more applause for that than anything I had done. Finally, it came back to normal. It was about eight seconds, but in my mind it seemed like eight minutes. This is an experience of acting on the stage. But it's amazing, and the Cagelles (dancers) are spitfires, they're fun, and I really like them. I'm going to stick with it and see what happens. I have fun every time I do the show. Your role is a difficult one. Your partner Albin (Chris Sieber) has all the comic stuff and you really have to react off him. You're a genuinely funny actor, so it has to be challenging for you to play straight. How do you make it interesting for yourself? You put your finger on it. It's strange because you go in and you think you're doing a comedy. It's your job like a caddy to set up the ball so that they can hit it out of whatever. I looked at the lines written on the t-shirts and I thought mine should say, "It's hard to be the straight man". The line of direction for this one is "He's in control". For me initially this was a huge learning curve. I am the adhesive storyteller, listener, reactor, and my character is the bookend too. 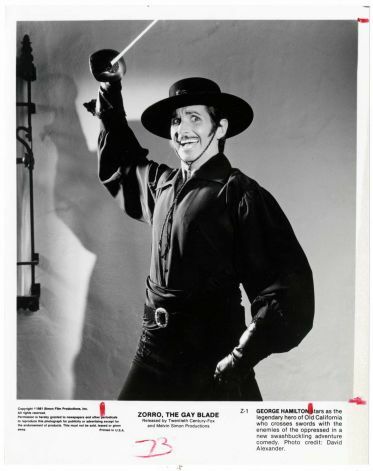 When fans come to see me, they expect me to be maybe what I was in Zorro the Gay Blade or Love at First Bite, but the trick in this is that Terry Johnson (director) really wanted it based on real emotions and not on camp lines. So what I had to do was connect. You have a moment of presentation, then you have a scene that's fairly fiery. Slowly you must realize that there is an organic relationship and there are moments that do not include the audience. And this show has so many footprints of the hands of others on it. You find an old Roman road that leads somewhere. At some point somebody turns out to the audience and reads the line to them. He makes a comment on it, breaking the fourth wall. An actor doesn't know whether he really wants to do it or not, because where does it go? It sort of disappears. Then at the beginning of the second act, the play turns slightly into a farce. There are organic moments and then it again becomes presentational in a cabaret. It's very deceptive and difficult. Switching over to your movie career, what is your favorite film role to date? There are five or six films that I produced that I like. People would never cast me in certain things; I'd have to produce it and do it myself, as I did in producing Love at First Bite and Zorro the Gay Blade. I'm a suit with perfect hair and a tan, and that's what I joke about. Sometimes they take my jokes seriously. Part of the problem for me as an actor is that I've always seen myself wanting to do the things Peter Sellars did. I had nothing in common with him, and that's why I wanted to do it. I've been somewhat of a mimic my whole life. I found a role that seemed just south of Cary Grant and I liked it. I held onto it for a while because I got good wardrobe and I'd get a good table (in a restaurant), so people thought that was me. You have to break that mold all the time. 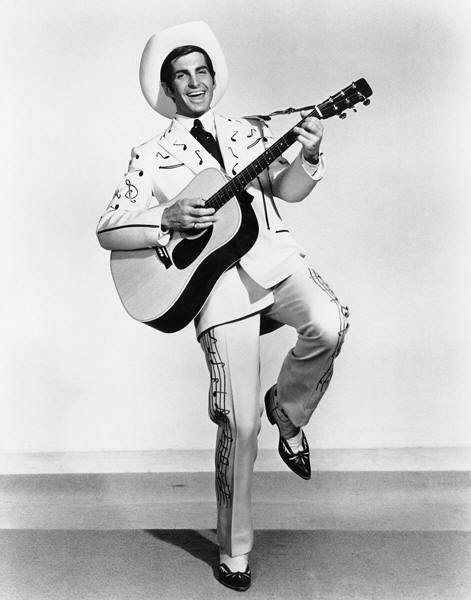 I liked that little movie that I made back in '63 about Hank Williams called Your Cheatin' Heart. I loved the film. I thought I really hit it on the head. I was playing an alcoholic, a 29 year-old country singer, nothing to do with me, yet it had everything to do with me. Little did they know I grew up in a little town in Arkansas and went to military school in Mississippi. I knew all about country music but that was not my character. You get type cast, and I like being type cast. It's like walking into a poker game where they don't know how to play. I know you are going to be great in the show. Look forward to seeing you on Wednesday night. George Hamilton is such an amusing man, I'm curious to see how he makes straight man Georges his very "own special creation". I'm sure there are lots of surprises in store. 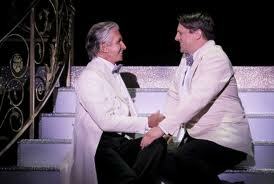 La Cage Aux Folles previews on Tuesday July 10 and opens on the 11th at the Pantages and plays through July 22 only. 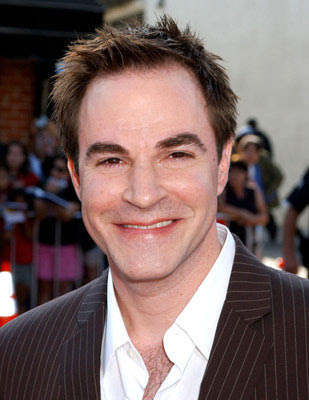 Comic actor/singer Roger Bart won a Tony for playing Snoopy in You're a Good Man, Charlie Brown and a SAG Award for portraying George Williams on TV's Desperate Housewives. His versatility has also led to voice over work singing as Hercules in the Disney film of the same name. 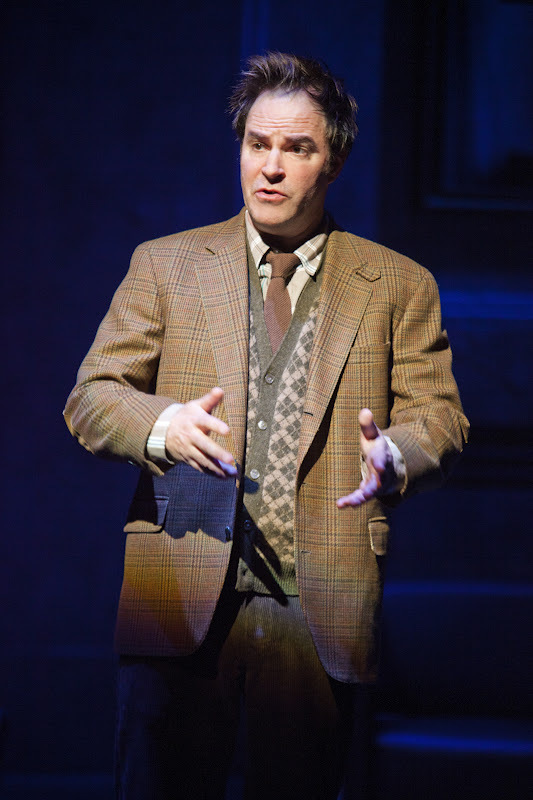 Bart will reprise his Tony nominated role of Carmen Ghia in The Producers at the Hollywood Bowl July 27-29. 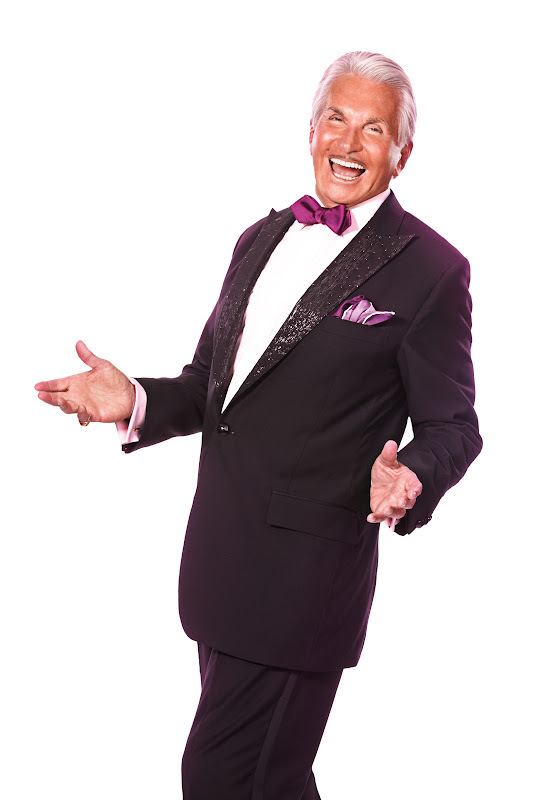 In our chat he talks about The Producers, Mel Brooks roles and other theatrical tidbits. 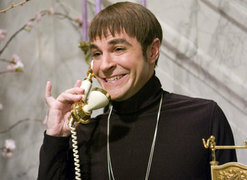 How many times have you played Carmen in The Producers? Only twice. The first year and a half of the run on Broadway and then I went away and did a comedy series here in LA, and I came back seven months later and did it again for three months with Matthew (Broderick) and Nathan (Lane). when they came back to the show. And of course the movie, so three! How do you approach a role that you've played before; how do you keep it fresh? Of course, it's at the Bowl this time and the Bowl is huge. Honestly, Don, it may be the only time in my life doing this show that somebody doesn't accuse me of being broad. I could have an esoteric conversation with you about technique which is just to talk, listen and respond, which in some ways is analogous to playing jazz with other great musicians. 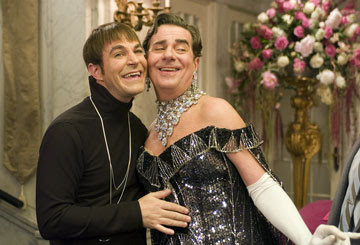 In The Producers, the material is so fun and so delightful to do...the relationship between Gary Beach and me...it's no fun unless I'm doing it with Gary Beach. We created a relationship that was so multi-dimensional that there was always something to discover there about their great happy partnership. Like jazz musicians in this kind of show, there's a myriad of ways to play the tune, and if those you're playing with, play it well, it is an exchange, an experience that is unique every night. In the perfect world of Mel Brooks we make Max and Leo as uncomfortable as possible with our liberal behavior...it's really fun. What about Young Frankenstein? Of course, again Mel Brooks! Apart from the size of the roles you're playing in each, as you have the lead as Victor Frankenstein and a supporting one in this, how would you compare the two? Young Frankenstein was really a sendup of the genre of horror movies. The Producers is really about putting on a Broadway musical. 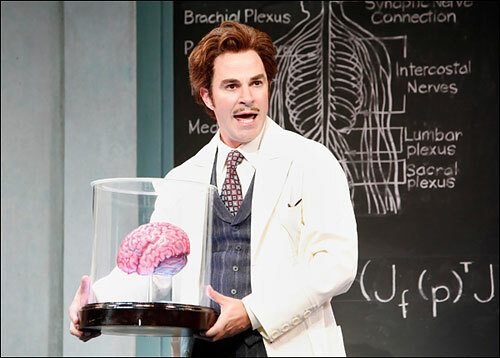 By virtue of that, it works better as a musical than maybe Young Frankenstein did. But that also worked great as a musical. My responsibility particularly...I did Leo Bloom for about two years altogether...the great thing about Carmen Ghia is he can be very flashy and silly and people get excited... but, I'm not onstage very much. I go out there and be a little eccentric or a lot eccentric, and I'm not onstage long enough where I have to sing a song explaining why I am eccentric. There are advantages to having a fun small part in a show. It's my job to be the driver, surrounded by all these wonderful character people, to be moving and buoyant and help everybody else so that they can come on and do what Carmen Ghia does. Talk a little about director Susan Stroman. She's extraordinary to work with. This is my third or fourth endeavor with her. She's a good friend and an extraordinary talent both as a choreographer and a director. We've always had a great collaboration as she has with most everyone she works with. The people that she hires around her are all great, and I don't think there's anyone I love working with more than Susan. You seem to have a wonderfully unique comedy style. Do you emulate anyone in particular? Where does it come from? Gary Beach would probably answer this the same way. I'm a huge fan of Warner Brothers cartoons. I would spend many hours alone after school watching Daffy Duck. I think Daffy Duck is one of the great comedic villains. I also have a great uncle who was a comedian in the vaudeville circuit, who worked with George Burns and Gracie Allen. With that DNA running through my veins...I come from ...my parents are MIT scientists...they're very bright, I don't know what happened to me. It's your sense of mathematics, music, the science of designing a role so that you are surprised onstage, and my influences that include watching the Marx Brothers and the math that went into designing that slapstick comedy, and all the training with the commitment to being truthful, can hopefully make for fun work. What is your favorite role to date? I love Carmen Ghia. I loved doing Leo Bloom, which was a fantastic part. I've also enjoyed having the opportunity to be fun and then suddenly make everyone cry. Like in Falsettos, I loved doing years and years ago; I loved doing The Who's Tommy. A great part in like a music video almost. I also loved doing How to Succeed in Business, the Charles Nelson Reilly part. They're deliciously comedic and conniving, and those classic shows like Business ares structured so perfectly, and the music, which I love, is swing and jazz...those roles I think are my favorites. Any role that you really want to play? Not off the top of my head. I think Danny Kaye would be an interesting person for me to try to work on...you don't know those until they come along. Hopefully they'll come along as I get older. I'm sure of it! How many weeks of rehearsal do you have for The Producers? Roger Bart is bound to be fantastic in The Producers at the Hollywood Bowl, Friday, July 27 at 8pm, Saturday July 28 at 8 pm and Sunday July 29 at 7: 30 pm Note the performances no longer start at 8: 30 pm!